We’ve made it to March — which means Spring is almost here! It also means I’ve officially been sharing my Favorite Things for 5 years… and that I will have a newly minted 4 year old in just 3 days!! Today I’m sharing a few more of my favorite things — all of which are $10 or less! Since we buy almost all our toys and games from thrift stores and second hand stores, we often need to replace the batteries. 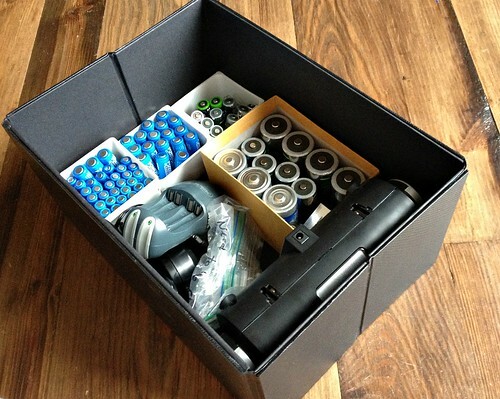 However, if the item needs multiple batteries, it’s hard to know if they are ALL dead, or if it’s just one bad battery. 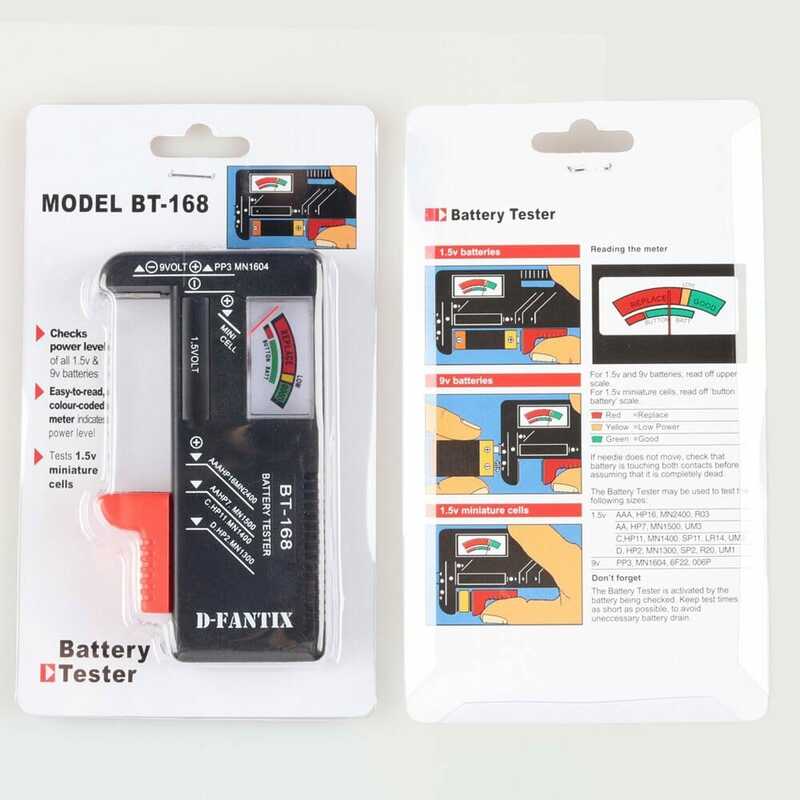 We use this battery tester (roughly $7 on Amazon) to test all our batteries. It has saved us so much time and money replacing batteries, and it tests almost every type of battery (even the ridiculously expensive button batteries so many kids’ toys require these days! The tester was definitley a good investment for us. Oh, and if you want to know how to quickly clean up battery corrosion, check out this post! 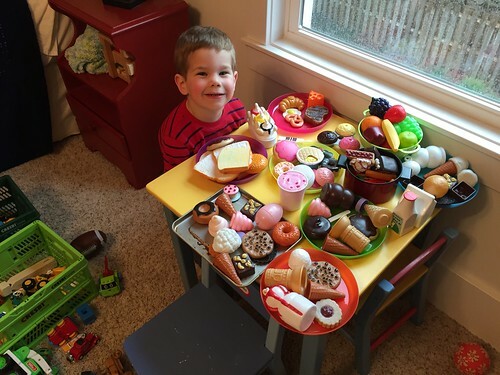 As I’ve mentioned so many times already, our kids absolutely LOVE playing with our kitchen and all the food that goes with it. 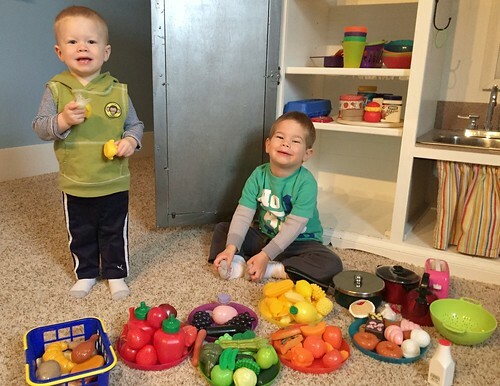 If you have young children or grandkids, save yourself a ton of money and look for play food the next time you’re at a thrift store (it’s quite pricy if you buy it new). The store will probably have it all in a zip-top bag, ready to go. 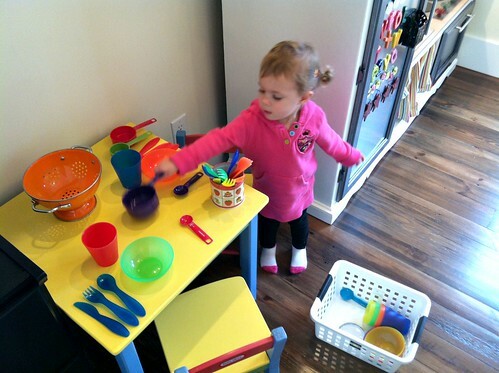 Then get a few plastic plates and cups, and your kiddos will probably be more entertained than with any other toy you could have bought them! Some of you might know that I’ve been a Colgate toothpaste lover for my entire life… in fact, that’s one of the reasons Dave and I have always used different toothpastes — because he always used Crest. Well, this past fall, I was on a mission to use up our ridiculously huge supply of travel-size toiletries — so I started using travel size toothpaste — and we apparently only had Crest. We had at least 8 mini tubes of the Crest 3D White, and from the moment I tried it, I absolutely loved it! 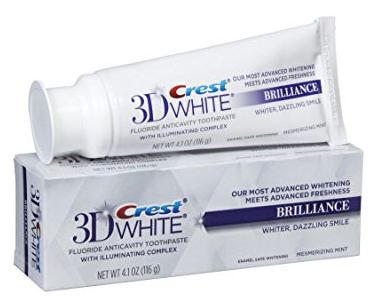 I am now totally sold on the Crest 3D White toothpaste and will continue to buy it in larger tubes once all our travel size tubes are finally gone! I’m not sure if it actually whitens my teeth (although people have often made comments about how white my teeth are) but I just LOVE how my mouth feels after brushing with it. My teeth feel so clean, my breath feels so fresh, and I love the “taste” of it. I know it might be weird to be so crazy over a specific toothpaste, but after 32 years of using whatever I can get for free or almost free, the last 4-5 months of using Crest 3D White has definitely made an impression on me! I’m normally NOT a big scent person — I almost always buy unscented everything. However, back in November, I got a freebie coupon to Bath and Body Works… and I smelled this lotion first when I walked through the door. I didn’t think I could find a scent I actually liked at Bath and Body Works, but since I had the free coupon and I wanted to get in and out as fast as I could, I “purchased” my free lotion and headed home. Little did I know I would absolutely LOVE this scent! I don’t know how to describe it, but it’s not fruity at all — maybe a little vanilla. I don’t know, but it works for me! 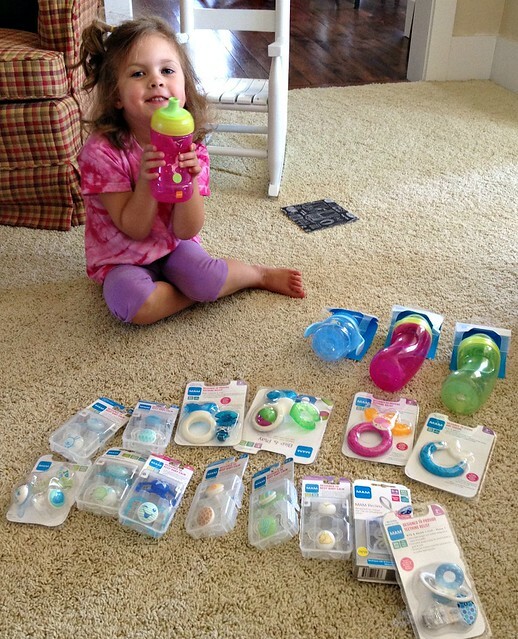 I’ve been a HUUUUUUGE fan of all MAM products since Nora was little — namely because they were the first and only brand of sippy cup she would even put her mouth on! Then, along came Simon and James, my two pacifier-loving boys, and my love for MAM products just continued to grow! 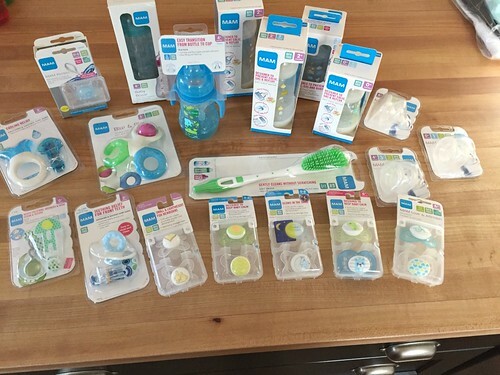 We’ve used their pacifiers, bottles, sippy cups, bottle cleaner, and teethers faithfully for the past 5+ years, and I give them as gifts to every new parent! 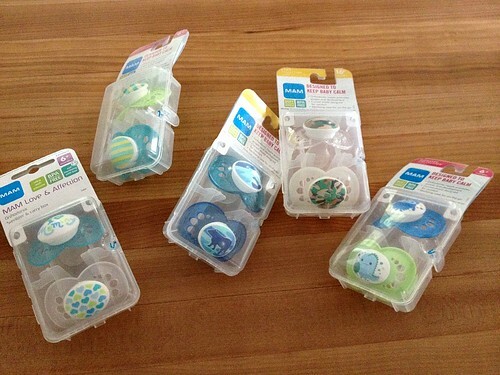 One product I don’t think I’ve ever specifically mentioned on the blog before is the MAM Pacifier Wipes. 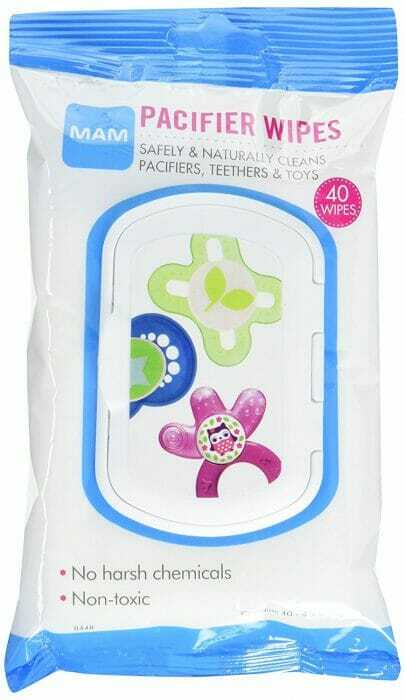 However, when I shared pictures of my diaper bag a few weeks ago, several of you asked about these wipes. I love the MAM wipes because they are specifically for things kids will stick in their mouths — so any type of teething toy, sippy cup, pacifier, or straw can be wiped down and instantly sucked on again without worrying about chemicals. I’m not a germaphobe, but I do almost always keep a pack of these wipes in my diaper bag and in my car! 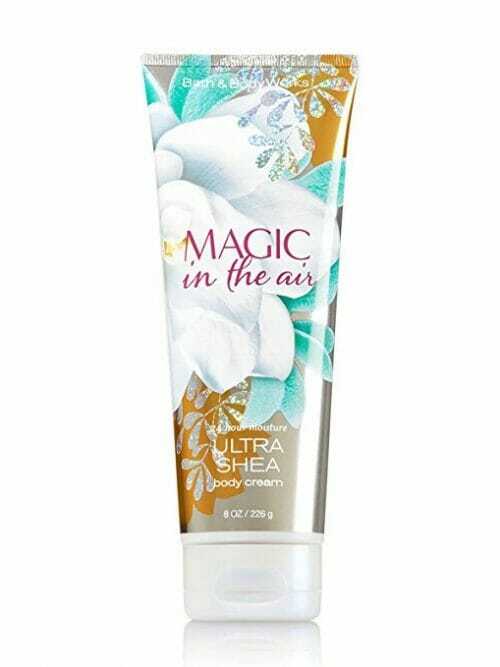 Just tried the “magic in the air” spray and lotion. Really like it, not too “perfumy”. Thanks for the recommendation! Hi Andrea! I’ve been reading your blog for years and it never fails to inspire me, so thank you! I have a Coworker that recently gave birth and will be returning to work in a few weeks. I didn’t get a chance to give a gift prior to her going out on leave and I’ve no children of my own so I’m in dark territory here. 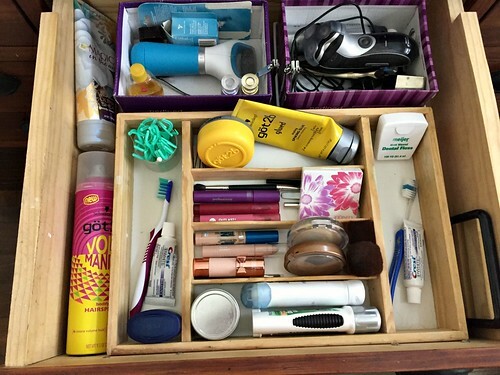 As a mom, can you suggest some thoughtful, practical products I could put together to give as a gift? 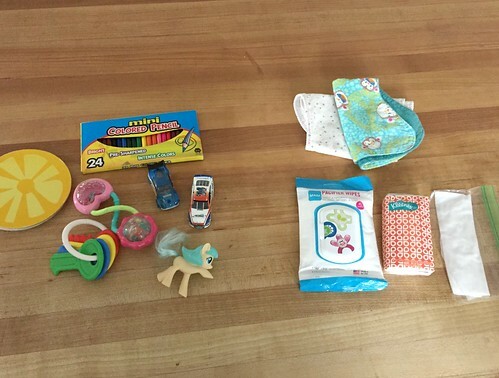 These MAM pacifier wipes seem ideal but not enough for a gift all on its own. oh wow — I’m not sure. Did you already look on her registry? It usually will tell you what has been purchased already and what hasn’t. You’d certainly be safe buying something from there! yes, the MAM wipes would be great! Also, size 2 diapers and wipes will most likely be appreciated by any new parent (assuming the baby is already a couple months old and out of the newborn/size 1). Also, you could do something for the mom instead — like a small coffee gift card (if she likes coffee). 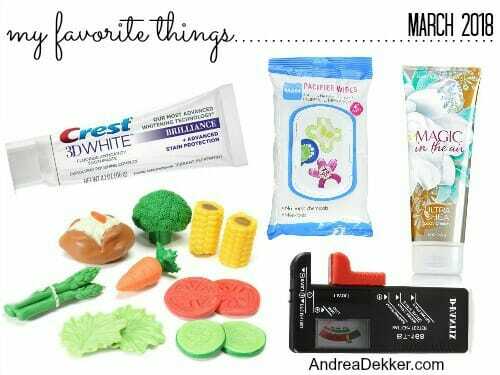 Even fun mints, gum, etc. could be a nice addition to a gift. My best advice would be to look at the registry or go with diapers. Hope this helps a little! Interesting to find out about your toothpaste preference. I’ve also used Colgate most of my life and only occasionally tried other brands if Colgate is out of stock at the store. Now that we buy at Costco the Colgate multiple packs are the one we get because they’re cheaper than the others. I may have to venture out to Crest just to try it. Is that actually a charger that charges batteries back from dead? 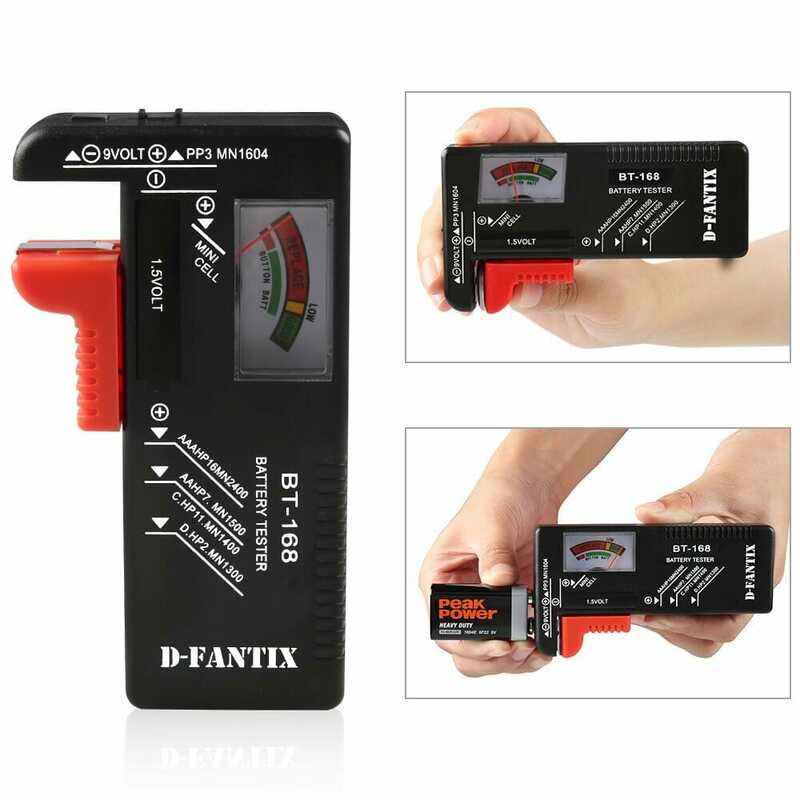 or just a battery tester? If it also charges batteries that’s worth it’s weight in gold. Just wondering because we always have batteries scattered in different areas of our home and I’d love to be able to put them to use. It’s just a tester — but still very useful! It’s shocking how often only 1 battery in a product is dead and the other 3, 4, or 5 are just fine! oh good grief — I’m just realizing why you asked if it was a charger… because I called it a charger in the post! Sorry! I just fixed the post! It’s definitely just a tester. We do have a charger too — but that’s only for rechargeable batteries! 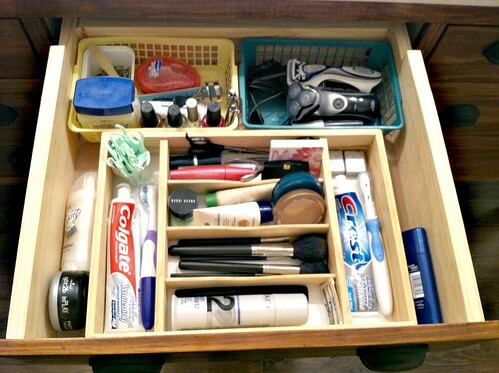 One question: Does that foot spinner, callus remover thing in the pic of your bathroom drawer really work!? I’ve looked at buying it a couple times but always put it back because its kinda expensive and I figured after the second or third use it wouldn’t work very good anymore. Knowing your frugal nature, I’d like you (or anyone else’s) opinion of how it works. Is it worth the money? Thanks! I have one, and I love it!! I buy the extra course sanding wheel. It lasts a long time, and makes my feet really smooth. yes, I also use the extra course sanding wheel! yes, I love the foot file 🙂 Here’s the post where I talk more about it. If you know that you will use it, then just buy it. I bought mine in local Costco, recently they have them on great sale, and it was around $30. Not sure if the Andrea’s brand though, mine is Amopé Pedi Perfect wet&dry, with 5 spare roller heads and a storage bag. For me, if i can get the cost down to $0.50 per use, the item is worth trying, and i easily see myself using this foot file at least 60 times. I like it a lot. this is such a great way to think about it — I like your goal of $0.50 per use!